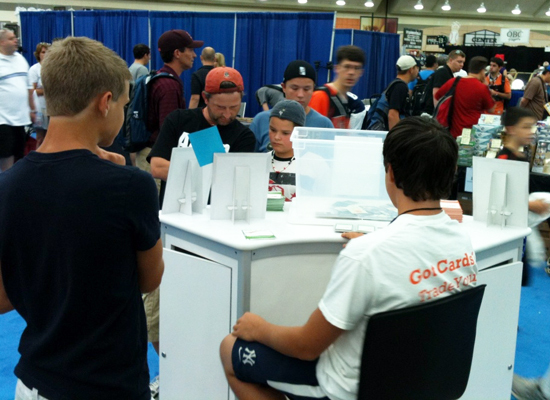 When it comes to collecting, most of the core audience is made up of males age 18-44 so it is important for Upper Deck to invest in engaging youth at trade shows because they truly are the future of this hobby. 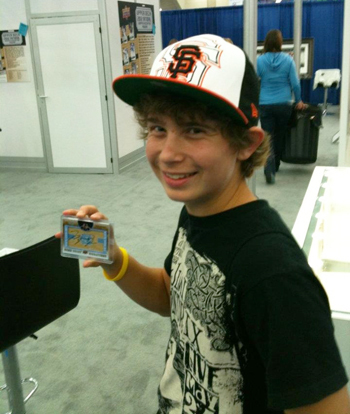 At the 2012 National Sports Collectors Convention, Upper Deck did just that. 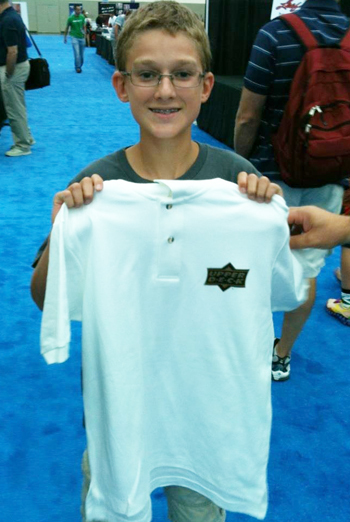 First, we wanted to make sure kids walked away with something more than just a pack of trading cards. 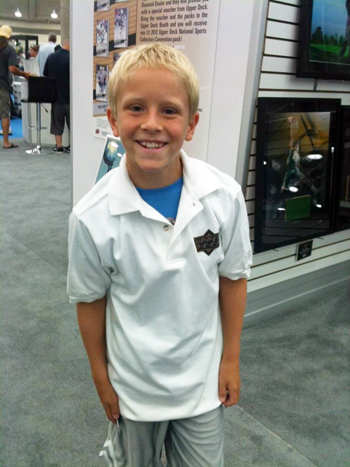 So we produced several hundred Upper Deck branded polos for the kids and shared them throughout the show. What a great way for them to feel like part of the team! Most kids didn’t want to wait to get home to try them on as they put them on right over the shirt they were wearing. Next, we continue to work with a charity that we are very proud to be associated with called Cards2Kids. This charity, started by a high-school student, collects trading cards through donations and then repackages them to share with kids at children’s hospitals, YMCA’s and schools. We provided them with space at our booth to talk with collectors and dealers about the program and we are proud to share Cards2Kids received over 100,000 trading cards through donations during the show. Kelly Woodruff from Upper Deck helps Ben from Cards2Kids accept donations of several hundred cards at the Upper Deck booth during the National Sports Collectors Convention. 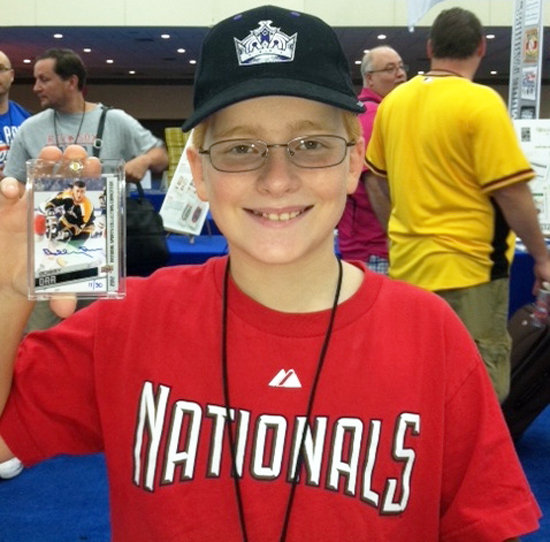 Upper Deck provided Ben from Cards2Kids with an area to talk to collectors and dealers about the charity. He was also interviewed several times during the weekend. Lastly, we made it a point to engage kids wherever possibly especially when they were opening Upper Deck packs or participating in the many activities around the booth. It is critical for the long-term success of the hobby that kids have fun during these shows so they want to continue to be active collectors. 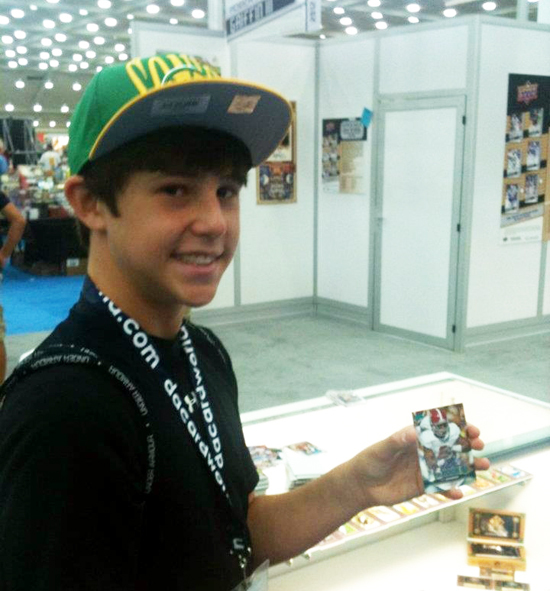 This happy young collector shows off his serious pull; a Trent Richardson autograph card from 2012 Upper Deck Football! One of the best pulls of the show came from Upper Deck’s expired redemption raffle where this young man scored a Michael Jordan autograph card! Thanks to all the kids who stopped by and we want to thank you for your support during the show and in the future!